The pleasures of great wine and great writers. Under the careful guidance of his father, Patrick Alexander began drinking wine with his meals at the age of five. At the same age, encouraged by his mother, he began a lifelong love-affair with books. The twin pleasures of wine and writing remained his passion for the next sixty-five years. He has raised his own children in many of the world's great wine growing regions, from Bordeaux and Piedmont in Europe to the Santa Cruz mountains of California while researching and writing his definitive guide to the novels of Marcel Proust. History of wine and some of the best wines. For the past six years, Patrick has been teaching a sold-out wine appreciation class at the nation's No.1 independent bookstore, Books & Books in Coral Gables, Florida. 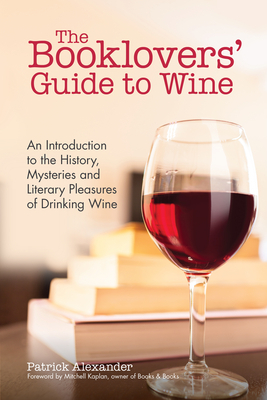 The Booklovers' Guide to Wine is based on this very successful class and blends Patrick's passion for the culture and history of wine and his love of literature for the world's great writers. A literary twist on traditional food and wine pairings, this book explores how great wines and great writers can be combined to enhance the enjoyment of both. The book describes the history of wine from the time of Noah to the birth of two-buck Chuck.